Final nail in Clydesdale’s mining industry coffin? The decision of opencast mining company Hargreaves to cease almost all operations in Scotland seems certain to mark the final end to hundreds of years of mining in the Douglas Valley. The announcement that only one mine in East Ayrshire is to remain open kills off almost any prospect of the company re-opening the Clyesdale opencasts it took over from Scottish Coal a few years ago, although it did, this week, submit a re-application to finally develop its Glentaggart East site near Douglas. However, Hargreaves confirmed to the Gazette on Monday that it had no immediate plans to start actual mining there and was only keeping its commercial options open. An environmental group said there was “next to zero chance” of the renewal of a 2013 permission resulting in any new mining there. Current energy issues have largely made coal mining in Scotland uneconomical. Essentially, actual mining operations ended in our area in June last year, at Broken Cross, and the only activity there by Hargreaves is a ‘restoration’ project being carried out by a skeleton workforce of 29. 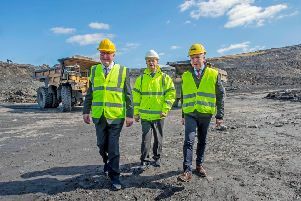 According the environmental campaign group Scottish Opencast Communities Alliance (SOCA), the plan there is to largely allow nature to take its course and allow the quarry to fill with water. This, and another restoration scheme going on at Mainshill near Douglas, is now causing SOCA concern for the legacy the industry will leave behind. It’s spokesman, Malcolm Spaven, told the Gazette in the wake of the Hargreaves announcement: “The great Broken Cross ‘hole’ will eventually form a lake and there are concerns that this will ever be useable or safe for public use for leisure activities. The main worry at Mainshill, given to the Scottish Coalfields Trust to clear up, is that, if the same policy is followed, then there will be a large body of water right next to the village and, more worryingly, on land that lies above the community. Shortly after the Clydesdale opencasts started to wind down it was discovered that the financial ‘bonds’ mining companies had been ordered to lodge by councils for future, post-mining restoration of the land to agricultural use were grossly insufficient to do the job.